Tim McCourt and Wesley Louis, two fellow animators I met during a Central Saint Martins end of year show, just finished a really nice short film I encourage you to see. 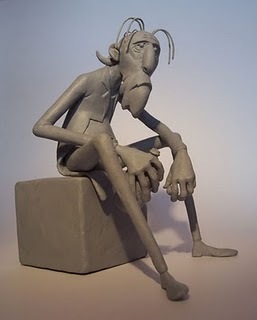 And here is the production blog, I am in love with the main character’s sculpture! [update] NONE OF THE TRICKS ARE WORKING but as I said it in the comments, there is nothing to worry about, it is only a problem with Quicktime when playing videos locally. If you watch them with a webbrowser like Google Chrome, the gamma doesn’t shift. Some of you might have noticed a realllly annoying bug with Quicktime pro when outputting to H264. No matter what compression, the video looks “washed out” or covered by a white layer. This problem seems to be due to the latest version of Quicktime pro that would assume the video you are importing has a Mac gamma (1.8) instead of the PC one (2.2). A trick has been running around consisting in tweaking the Blend and Straight alpha settings but the most picky of us realized that the blacks still weren’t as black as they should be. I found what seems to be the solution in the looooong series of comment following Andrew Krammer’s original post with the above trick. One of commentator is suggesting to fool Quicktime pro by first opening a Tiff picture then importing the video. This way Quicktime doesn’t apply that screwed up gamma. 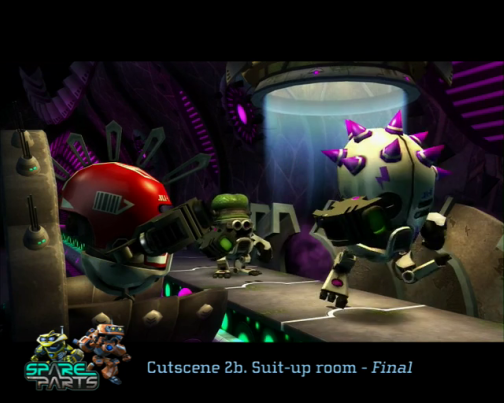 And an other progress reel for Spare Parts Cutscene 02b. 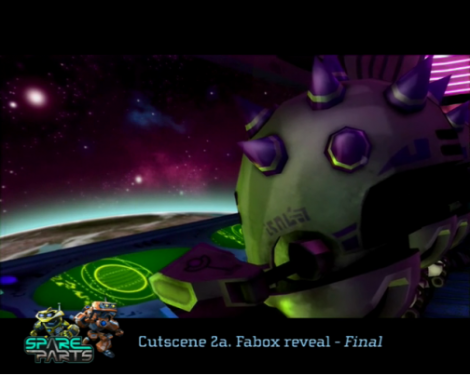 That sequence followed Cutscene 02a during the game. The lighting is “In Game” and the shadows are baked or faked. For the layout, I reused a run cycle I had done for in-game animation and quickly tweaked it so the character could come to a stop and restart. As you can see there is no offset in the cycle yet. 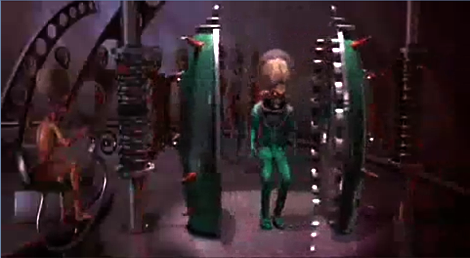 The idea at that stage was to convey that an entire army was getting ready for the fight and a long queue of enemy would go throught the suit-up machine. This eventually got ditched as I didn’t have time to animate all those guys reacting to what was happening in front of them. The rigs were also really really slow and I couldn’t get more than 2 of those guys in Maya at the same time. After pitching the idea to the executive producer, he suggested that one of the characters would get his helmet the other way round to give a more comical effect. I was delighted as it meant I could have a bit more time and went a bit further by having the guy getting stuck to the machine. The chair is missing here as Ross our concept artist was working on the final environment and I changed the colour of the tube to match the colour of the LCD screen in the previous shot. At that stage I had establish that the good guy would use a variation of blue colours and the bad guys a variation of greens, ultimately we went for purples in final. If you pay close attention to the end of the shot, you will notice that the arms on the poor fellow have been inverted when he has his helmet the other way round. As the helmet and the arms were constrained to the same control, this was the only way I could achieve that effect. Talking about constraints, while in the air, I parented the upper body of the character to the transparent box you can see at the top to allow for the flailling legs and rotation of the main control without affecting the upper body. Originally the tube was supposed to be transparent and show that but when in game, we ran out of time to make it work. Few weeks ago “Last Chac” shared with me a lovely animation he just finished, a lovely cartoony singer/pianist on a Lady Gaga acoustic sound track beautifully rendered. 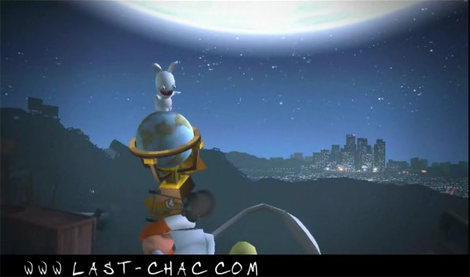 Last Chac also happen to be a very good animator performing his duties at Ubisoft Montpellier in the south of France and I was immediately seduced by his “Raving rabbids” showreel. The Wii is too last-gen for me so I have never tried any of the cartoony titles it offers but that one would be one of my favourite games on Xbox 360 or PS3. I don’t have a direct link to his Raving Rabbids reel but you will find it in the Demo reel section and “Lapins Crétins” section. Really fun work Chac and obviously no motion capture went into the making of that game! Joan Delmont and Chloé Bocktaels, two of the animators I worked with on the Chico Chica Boumba pilot last year are finally releasing the first teaser video for their personal project: “Small riders”. “Small riders” is a series of animation featuring two very appealing cartoony characters, Camille Beaumaison and Eugénie Schlhert, a michievous skaterboarder and an angry inline rider who share the same passion for skateparks. “Small riders” is produced by Zeilt, the good people behind the very quirky Mr Hublot, and they are hoping to find some financial backing if “Small riders” generates enough response. 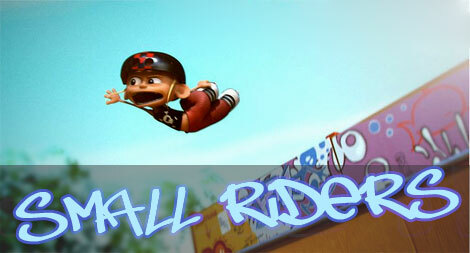 Come on, show your love for “Small riders” and get updated when the next teaser comes out! Nothing to listen to at work? Hungry for Animation related podcast? Run to Animation Conversation! A fresh podcast with a nordic taste by my APT buddy Erlend and his friends.